The information in this video is valid only for dSPACE Release 2017-B and later. As of dSPACE Release 2017-B, the licensing technology for protecting dSPACE software changes. This video shows you how to connect a host PC to a dSPACE License Server using CodeMeter Runtime. New Licensing for dSPACE Products: An Overview As of dSPACE Release 2017-B, the licensing technology for protecting dSPACE software changes. This video introduces you to the new technology. Installing dSPACE Software This video shows you how to install dSPACE software (valid only for dSPACE Release 2017-B and later). 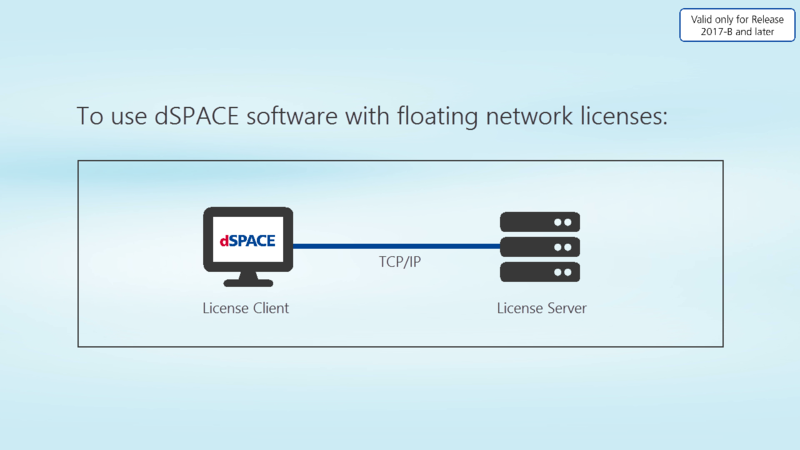 New Licensing: Basics on Floating Network Licenses As of dSPACE Release 2017-B, floating network licenses for dSPACE software use the CodeMeter licensing technology. This video introduces you to the basics on floating network licenses for dSPACE software. New Licensing: Setting Up a dSPACE License Server This video shows you how to set up a dSPACE License Server with CodeMeter Runtime (valid only for dSPACE Release 2017-B and later). New Licensing: Activating Floating Network Licenses This video guides you through the license activation process for floating network licenses (valid only for dSPACE Release 2017-B and later).